The path from Interbay Station to 28th & Dravus is pretty steep and there isn’t currently any transit service on the steep part of Dravus. Would Metro have to have a dedicated hill-climbing fleet to serve that segment? Overall, I think now is the time to starting a conversation with Magnolia about how they want to be connected to downtown, Ballard, Fremont and the UW. There are lots of higher density apartments and multi-unit housing structures on the east side of Magnolia but the western side is all vast lawns and 2 car garage houses. The areas that are open to density can be rewarded with frequent connections to Link, but it’s kind of ridiculous to offer bus service every 15 minutes on streets that are built with mansions. The Interbay Station neighborhood looks like it will require some special attention if it’s going to become a station with significant ridership. Things could change but 15th NW is already very hostile to foot traffic and with Link construction the divide between Magnolia and Queen Anne may even become worse. Interbay Station could become the Rainier Beach Station of Ballard Link: a place to make transfers but offering very little else to generate ridership. Good idea. But I wouldn’t wait until the train gets there. A lot of people have commented and proposed changes to the 31 and 32 which suggests that they really could use improvement. Rarely do they talk about the eastern end (you are the first I know of — and your idea has merit, but only once Link gets to the U-District). The fact that so many people think the western end of the 31/32 could use improvement suggests that something is wrong there. I agree. A big part of the problem is running a bus on Emerson. As I pointed out in this comment — https://seattletransitblog.com/2017/05/18/magnolia-restructure/#comment-776769 — it looks good on paper, but really doesn’t work in the real world. (By the way, I didn’t discover that myself, someone pointed it out to me and I just confirmed it using Google maps). Emerson doesn’t make sense — you should send the bus to Dravus instead. Today. Of course it will make even more sense once Link gets there, but there is no reason to wait. The other weakness is that the 32 just seems redundant. It is the fastest way to get from Lower Queen Anne to SPU, but only if you time it right. With frequency typically at 30 minutes, and the transfer to the 31 so bad, it just isn’t a great bus route. It was also put in before the 13 went all the way to SPU. If you beefed up the D and ran both the 31 and 32 to Dravus, most riders would come out ahead. That is why I suggested this: https://drive.google.com/open?id=1EDI0cT31ZpXXYpZuQCUUlWb8xQU&usp=sharing. With this in place, you could modify the 24 so that it simply stops at Government Way. That simplifies the 24 quite a bit. For many that means a two seat ride to downtown, but so be it. 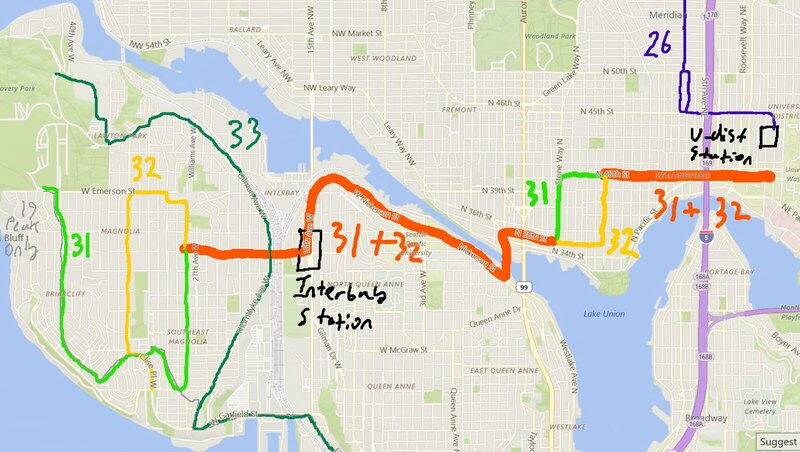 Better yet, you could send the 24 into Discovery Park, which would mean you could get rid of the 33 in the middle day. You could still keep the commuter runs, but doing that would mean a very efficient all day layout for Magnolia. Of course, to get it to work you need better headways. The most important part is arguable the D. If you transfer from a half hour bus to a very frequent bus, it is really not much different than if you just head downtown. You just time that first bus. But if the second bus is not frequent, you hate your transfer. I think you could squeeze twenty minute service out of the 31 and 32 (or ten minute combined) but the D could use improvement as well. Right now it runs every 12 minutes in the middle of the day, which just isn’t great. The other drawback is that the 24 and 33 go straight downtown, while the D does not. That is great for a train (and appropriate for a major route, like the D) but not great for the bulk of the riders (who just want a fast ride downtown). One option would be to run a RapidRide run like so: https://goo.gl/maps/CcCfqorH9SD2. This makes sense after the 40 is converted to RapidRide+ (Corridor 6 listed here: https://seattletransitblog.com/2015/12/21/rapidride-the-corridors/). By then much of the route — in fact almost all of it — would have RapidRide treatment. So this becomes an express for folks on 24th and old Ballard. They would have a much faster route to downtown (faster than the 40 and even faster than the D). Ideally you mix that in with the D, so that you have 6 minute combined service to Ballard from downtown. Someone in Interbay (whether they arrive via a bus or walk) would have a very frequent ride to downtown (and if they are lucky, a very fast one). But that is pretty bold, and might not happen for a while (if ever). But if you simply improved the D to every 8 or 10 minutes (or better yet, 6) then the transfer penalty goes away, and this starts looking like a major improvement for Magnolia. Oh, and I agree with Guy. It is unrealistic to expect a bus to go up Dravus. It is a very steep hill. The steep hill might work if it had to be done, but there is also a tight S curve at the top that would be terrible. Also, Dravus really doesn’t do anything once it’s over the hill. It’s busy because it connects to 15th, not because there is much along it worth serving west of 22nd. If a bit of money could be invested in the tangle at Emerson and 15th, so the bus didn’t have to wait for the bridge traffic just to cross 15th, it would help a bit. There’s a cluster of density towards the north end of that part of Magnolia that might be good to keep near east-west service. >> The steep hill might work if it had to be done, but there is also a tight S curve at the top that would be terrible. Yeah, that little curve at the top is crazy steep (it wouldn’t surprise me if it closed right now because of the snow). >> Also, Dravus really doesn’t do anything once it’s over the hill. It’s busy because it connects to 15th, not because there is much along it worth serving west of 22nd. There are apartments along Dravus until about 25th. But the biggest cluster around there is to the north a little bit, off of Manor. Serving that area with a bus route would make a lot of sense, but again, the issue is the grade of the hill — https://goo.gl/maps/548M95nL4mL2. If you could do the 31/32 split as Alex suggested, then I would send both buses up to 28th via Manor (like so: https://goo.gl/maps/v6E4gXtVQ7E2) then split. Either that or split at 20th, and send one bus straight up Dravus, while the other climbs up Manor. Either way, this will likely have to wait until we have electric buses (or hybrids) capable of climbing those hills. >> If a bit of money could be invested in the tangle at Emerson and 15th, so the bus didn’t have to wait for the bridge traffic just to cross 15th, it would help a bit. There’s a cluster of density towards the north end of that part of Magnolia that might be good to keep near east-west service. Yes, which is another reason why I would like to see both buses go to Dravus. If you are going to add bus lanes (or skip ahead lanes) then it makes sense to make the most of your investment. Right now the buses split, just so that you can serve one stop in Fisherman’s terminal, which is merely three blocks away from the stop the 33 uses. Get of the split, and improving the shared section would be easier to justify. By 2035, slower-moving driverless buses will probably be so developed that lower-density areas less than two miles from a Link station will be served by them. If the Ballard transit crossing is designed for both buses and light rail trains, that would open a number of options to have transfers between the two at the same platform, facilitating the effort for riders. It could also be a strategy if the new second Downtown tunnel gets belayed by several years. That may be a useless feature if light rail frequencies are high though and the project goes as scheduled. I think it is hard to envision a preferred complete transit network outcome at this point. Still, the important aspect of this is for these vision possibilities to inform ST3 design decisions. Do we even need the 26X in this world, or can some reconfiguration of the 45, 62, and 67 cover that corridor? As it stands right now, the really unreliable parts of the 26X are in Wallingford and Green Lake, where it has to make a series of unprotected left turns and wacky deviations to satisfy some historical obsession. I can certainly get behind an improvement in the 31/32 – its lack of frequency is a big problem right now, along with the 31 not running on Sundays/holidays at all. I have often wanted to get rid of the 26, but I do find it useful to go from Cartridge World on 45th to central Seattle and via its through-route to Costco, and from downtown to Greenlake, or from Northgate to Wallingford. Some of this will be obviated with U-District Station, but right now it’s a long bus ride to UW Station or an unpleasant walk across the freeway to the miserable 512 stop and unpredictable freeway traffic jams. To answer your question we should to step back and ask, who are the target users of the 26, where do they want to go, I assume the target users are along Latona, and people disagree whether the 62 is close enough. Fremont is an urban village so there must be a market for Latona to Fremont. although the 62 stops a couple blocks away. The Northgate extension seems arbitrary: why was it attached to the 26 rather than the 62? The question is how many people in Latona want to go to Northgate? It seems like north central Seattle should have a route to Northgate: Roosevelt is on the other side of the freeway. One draft of the cut planning attached the 26 to the 30 (Greenlake – Latona – Sand Point). That was an attempt to save the 30 (and possibly save the 26) in spite of low ridership. It didn’t go through because people in Latona didn’t want the 26 going east. The result was that the 30 was reduced to peak only and then deleted. (The reduction was in the first round of cuts. The deletion was in a later round that was canceled, but then the U-Link restructure deleted it anyway. Prop 1 will apparently restore it in some form next month.) So that may be a strike against rerouting the 26 to U-District Station. I’ve never lived in Latona or lower Wallingford, so I’m not sure how important it is, or in general for a route there to Northgate, Fremont, and downtown. Somebody with more local expertise could answer that. My partner and I live near one of the nexuses of the 26 and 62 (40th & Stone), and frequently travel to the other one (E Green Lake). Whether we’re going north or south, we’ll take whichever bus comes first, so it works out to be the 62 ~70% of the time just because its frequency is higher. Going northbound at evening peak, most of the riders do seem to get off along Latona, and is close to empty by the time it gets north of Green Lake. It makes sense, because anyone who wants to get from downtown to Northgate would just take the 41. As for Northgate vs 65th for the 62, we actually prefer 65th but for selfish reasons – we have friends and events to get to close to Magnuson so it is much more convenient now than it was before with the 16, 71, and 75. The only reasons we went to Northgate in the past were getting supplies at Target, and Group Health. Now there’s a Target downtown, and our doctor is at the Capitol Hill Group Health/Kaiser building (short walk from Link), so we haven’t gone to Northgate in years. The 26 is similar to the 28, in that it is needed for coverage reasons. It isn’t obvious when you look at a transit map, but that is because the gigantic wall that is I-5 is not labeled prominently. Without the 26, it is a long walk to the 62 if you are on Latona or further east. You can cross the freeway, but that is only handy if you are on 45th, 50th or 65th. 1) As you mentioned, serving the area north of 65th is problematic. Much of the way you haven’t added much, since the route is only a block away from the 45. As it approaches 80th, though, you get some separation from the 45, and thus it acts as a coverage route again. But this is when it can get really bogged down (with freeway traffic and left turns). 2) North of 85th you have coverage again. You also have a connection that doesn’t exist otherwise (Northgate/Licton Springs/NSCC to Green Lake). But things get very screwy there. Northgate is a transit center. It makes some sense to send a bus there, just so it can connect to other buses (there are also a lot of other people and businesses there). But just when it looks like you are about to cross the freeway (at 92nd) you take a little loop through the college. 3) When Link gets to 65th, this will be a ten minute walk away (close enough to wonder why the bus doesn’t serve it). 2) Run the 63 all day, but send it to the U-District instead of Cherry Hill. Something like this: https://goo.gl/maps/KEGpiL6oNBE2. Now you have covered pretty much the entire area, but the buses run a lot faster. There is some extra walking for some people, but not that much. If you are on 80th, you either walk to Wallingford (to catch the 45) or walk across the freeway to 5th (to catch the new 63). If you are north of 85th, you can walk south to catch the 45 (on 85th) or up to 92nd (to catch the 345/346). Overall, I would say there is less of a hole within the system. With the new routes, the worst possible place to be is on 80th, midway between Wallingford and 5th. You have a seven minute walk to either bus. On the other hand, if you are on 82nd and 2nd Ave. NE (on the other side of the freeway) you have a longer schlep to either 92nd or Roosevelt. You’ve also made life easier for folks on Weedin and 5th Ave (which has a lot of apartments as well as some shops). But the only place where that is the case with the northern part of the 26 is where it is shared with another route, or within a block of it. Overall, it just looks a lot better from a coverage as well as a speed standpoint. Way fewer people have to walk a long way to catch the bus, and when they do catch one, it moves faster. Very good of you to point this out. When I wrote this restructure here: https://seattletransitblog.com/2017/03/12/north-seattle-bus-routes-after-northgate-link/, I didn’t consider the flaws with the north part of the 62. I think it makes a lot of sense to modify it after Link get to Northgate. There used to be a lot of ridership between NSCC and Wallingford, but that has probably dried up now that housing is so expensive there. Back when I used to live around NSCC, I would occasionally ride the #16 to Wallingford (now, route 26, after U-link restructure). That bus was extremely slow, and very unreliable – enough that anybody with a car would almost certainly just drive. The new route slightly better in reliability, but just as slow, and requires more walking for people that live to the north of NSCC. In a post-2021 world, I would seriously consider just walking across the I-5 ped bridge (doesn’t yet exist), hopping on Link, then switching to the 44 in the U-district. Of course, simply hopping on a bike is probably as fast as anything. >> In a post-2021 world, I would seriously consider just walking across the I-5 ped bridge (doesn’t yet exist), hopping on Link, then switching to the 44 in the U-district. Exactly. None of the changes I suggest make sense until Link gets to Northgate. But I think we should simplify these routes, and avoid having routes that go back and forth and take forever to just go a few blocks. I think you will get a lot more riders if you speed things up (because riding will be faster and have less waiting). I lived in Wallingford at 43rd and Bagley, so I went south four nights a week when the computer lab closed and round trip on Saturday. Since I worked at the U I took the 5 Blue Streak (later 355) from the bus pad to 85th and Wallingford and walked. The old 16 was a slow bus; if I just missed it I just home. This was in the late ’70’s and early 80’s when traffic was pretty non-existent in Wallingford and East Green Lake other than on 45th. It would be a hard sell for the frequent route-pair to go to the U-District rather than downtown. Magnolia is not in North Seattle: it would require crossing the Ship Canal twice to get to downtown. And while you could transfer to the D or future Ballard Link, that might not seem like enough benefit. At the same time it is a long way to downtown, and the riders from downtown that make the 24 and 33 “high-ridership” get off at Elliott-15th businesses, not all the way to Magnolia. That reflects the gap in the D where it detours to Uptown, and the fact that the 15 goes the wrong way and is peak-only. So that market doesn’t have to be on a Magnolia route. At the same time, doesn’t Magnolia belong with Central Seattle rather than North Seattle? But given the low density of Queen Anne and the lake barrier to Capitol Hill, maybe it does make sense to go to Fremont and the U-District instead, which are both urban villages with a diversity of offerings and no barriers in between except the bridge. Fremont Wallingford. Although it only goes through the Wallingford residential area, not the businesses on 45th. So the only urban village it really goes to is the U-District. >> It would be a hard sell for the frequent route-pair to go to the U-District rather than downtown. The key is frequency, especially on the D. It reminds me of the situation to the Northeast of the UW Station. I have a friend who commutes in to downtown every day. He walks to 65th and 35th and then takes either the 76 or the 372 (whichever comes first). He prefers the 76 because it is faster (and there is no transfer). But he won’t wait for it. If the 372 is there, that is the one he takes (and then transfers to Link). When going the other direction, he takes the train first, every time. He has said several times that the great thing about Link is not the speed, but the frequency. I think there are several things that need to happen before you could change a route like the 24. 1) Improve frequency along 15th. The easiest way to do this is just add more D runs. 2) Send both the 31/32 to Magnolia via Dravus. 3) Improve frequency on the 31/32. All of that can happen independent of other changes in Magnolia or along 15th. Running the 31/32 more frequently makes a lot of sense when Link gets to the UW. Then that becomes the fastest way to get from, say, Northgate to Fremont. The Gas Works area has also seen considerably growth, and having frequent service on Nickerson seems justified for several reasons. Frequency makes up for the two seat ride from Lower Queen Anne to SPU (the change to the 32). With the 3/4 ending at Nickerson, it means folks from the top of Queen Anne have a good two seat ride to Fremont, Gasworks or the UW. What is harder to justify is very frequent service to Magnolia. However, the buses will spend a relatively short amount of time in Magnolia, and there is a split, so this is not an especially expensive thing to do. I could see running the 31 and 32 every 20 minutes. That means that the combined corridor has ten minutes service, while buses are run every 20 minutes through Magnolia. Magnolia doesn’t have any stoplights, so the tails are relatively cheap. If they pick up people, the route is justified; if not, the buses cruise. The combined corridor — even the small Magnolia piece — manages to cover a lot of Magnolia riders. Consider my suggestion made up above: https://tinyurl.com/y8q6u5mm. If you are at 22nd and Manor, you want the 31 (the red bus). But if you miss it, you can walk to 22nd and Dravus, and catch the 32. 4) Run an all day (partially truncated) 18, timed with the D. It would either end at 65th or 85th (not in Blue Ridge). This would be a nice bus in its own right. That provides a faster one seat side to downtown for people on 24th (faster than the 40) and a faster connection from 15th West to downtown (it avoids the Queen Anne detour). I would make it RapidRide (since it could share RapidRide stations almost the entire way). All of this together would mean someone could get from Magnolia to the two main corridors of Ballard (15th and 24th) quite easily. It means that someone from downtown could take the fast bus (the 18) to Interbay, and then transfer to get to Magnolia (if they time it right). The addition of kiosks and apps plays a big part in this — a rider can get to the stop and quickly see whether it is worth waiting for the other bus. At that point, you start talking about consolidating midday service to Magnolia. Get rid of the wiggly-squiggly 24 and replace it with something more straightforward. I just added a new 24 on the map. Again, the key to this working is having very good frequency. The new 24 should run every 15 minutes, and so should the 31 and 32 (which means every 7.5 minutes combined). That isn’t perfect, but it seems a lot better than what folks have right now. If we’ve learned anything from the last restructure, it is that half hour buses — especially in the middle of the day — just don’t work for people. Someone might time their commute (if they can) to take a fast infrequent bus, but most people are like my friend — they take the first bus to show up. Even with all of this, I would keep the other buses (e. g. the 19, the 33 and the old 24) but run them only during rush hour. That is when buses like the D are very crowded anyway, and you don’t gain much by running them more often (since they are already fairly frequent). But as a midday schedule, this seems very good to me, and a big improvement over what exists now. I could easily see taking buses in Magnolia to get around to most places with that kind of schedule. Right now I couldn’t (I would just drive). I wouldn’t try and implement this all at once. I think the thing to do is improve the 31/32 (by increasing headways and sending both through Dravus to Magnolia) and see how often people make the transfer. That means overlap, but that is a good thing. If I’m trying to get downtown and see that the 33 isn’t expected for another 20 minutes, but the 31 is within view, I’m getting out my Orca card, knowing the D will get me downtown a lot faster. Of course a lot of people in Magnolia might wonder why the heck Metro is improving frequency to the U-District and not downtown (your original point). But as long as their old buses still run just as often, they won’t care. If they are curious, then you can simply explain that much of the city has grown considerably, but Magnolia hasn’t. Ending the 31 and 32 in Magnolia just happens to be the logical place to end them (it is just geography). The forced transfer at Dravus would be very unpopular. It is a lousy place to transfer, loud, stinky and lonely. And, have you thought about the Downtown-to-Magnolia transfer? The D stops just north of Dravus on the east side of relatively wide 15th Avenue West. The 31/32 of your proposal would be coming south on 15th and turning onto westbound Dravus. Riders into Magnolia would have to deboard the D, walk back to Dravus (the bus stop is about a half block from the corner), and then walk across 15th West (two stop lights required) and some undetermined distance west on Dravus. That’s a two-to-five minute transfer penalty. The Magnolia-to-Downtown transfer would probably be much more acceptable, depending on the placement of the eastbound stop on Dravus.